The former French Catholic diocese of Noyon lay in the north-east of France, around Noyon. 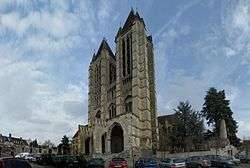 It was formed when Saint Medardus moved the seat of the bishopric at Vermandois to Noyon, in the sixth century. For four centuries it was united with the bishopric of Tournai. Then in the twelfth century it was again independent, and the bishop of Noyon became a pairie-comté of France. The diocese of Noyon was brought to an end by the French Revolution. Its territory passed to the diocese of Beauvais.